OK, so I’ve neglected this blog for a while, but I haven’t completely forgotten about it. I’d like to revive it by posting a draft of a shaping tutorial I recently made. One of the most common gripes I hear about Japanese patterns – even the ones that have been translated into English – are that the shaping instructions are confusing, vague, incomplete, baffling… well, you understand the idea. They’re almost always three numbers, such as 2-1-5. (If there are four numbers, it’s because the item is worked in the round and/or has evenly spaced shaping worked in more than two locations, not just at the right and left edges of the work.) This kind of notation is used almost exclusively in knitting patterns, but I have seen it pop up in crochet patterns once in a blue moon. The good news is that these instructions are, contrary to complaints, not the least bit vague. They’re very precise and tell you exactly when to increase or decrease (or work short rows). You can download the tutorial right here: Japanese shaping notation (second draft 7/28/2011). You’re welcome to link to this page if you find the tutorial helpful, but please do NOT repost this tutorial anywhere online (that includes your website, blog, Facebook, Ravelry, etc.). Many thanks to Pierrot Yarns for allowing me to use one of their schematics in my tutorial. Questions? Comments? Feedback is most definitely welcome! I consider this a draft, so I’m happy to revise it if anything is confusing. I have proofread it several times, but if you do happen to spot a typo, please let me know so I can fix it ASAP. The other day I cast on for this Pierrot Yarns sweater vest (click here for Ravelry link) that’s been in my knitting/crochet queue for a long time. There’s a knit-a-long on Ravelry if you’d like to join in. I’m using some mill end tweed I got from WEBS. It’s a bit rough on the hands while knitting, but it really softens up after washing. Yet another reason to wash gauge swatches – if I didn’t know it got softer, there’s no way I would’ve chosen this yarn. I had to resize the vest to make the bust slightly larger, but other than that, it’s pretty smooth going. I also decided to work it in the round. 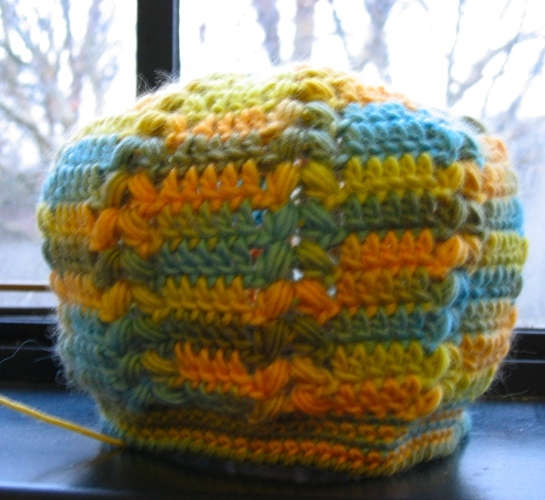 For me, knitting is much faster than purling, so doing it in the round speeds things up. It’s a lot more yellow and less orange than the photo shows. I’m pretty pleased with it so far. I’m also doing some knitted sampler squares when I need some portable knitting. (The sweater vest isn’t very portable because the cone of yarn I’m using weighs a ton. Don’t feel like lugging it around.) I’m using up worsted weight remnants to make squares that I’ll eventually seam together into a blanket. Nothing original about it, but it’s a nice way for me to use up scraps and try out new stitch patterns. Let’s see… what else? Oh, I picked up a copy of the new summer Keito Dama last week. Lots of cute summery crochet outfits in this issue. I should’ve posted about this earlier, but I just wanted to remind folks that there’s still time to enter the Pierrot Yarns contest. The idea behind the yarn is to showcase the company’s yarns, so you can enter any item you’ve either knit, crocheted, or woven with one of their yarns. There are some pretty nice prizes (gift certificates, books, etc.). Plus, everyone who enters something in the contest receives an entry prize, so there’s nothing to lose, right? Now for finishing. We know that we have to bind off stitches for the collar, as shown in the schematic. That implies that the rest of the stitches are not bound off. Those who can read Japanese know that the tips section at the top suggests kabuse-hagi as the join method for the shoulders. I’m familiar with this technique from machine knitting, but as far as I know, it has no English name in hand-knitting terms. But let’s assume you can’t read the Japanese bind-off suggestion. What to do? Well, choose a bind-off that makes sense for your particular pattern. Since the shoulders have been worked in k2p2 ribbing, Kitchener stitch might be a nice method. 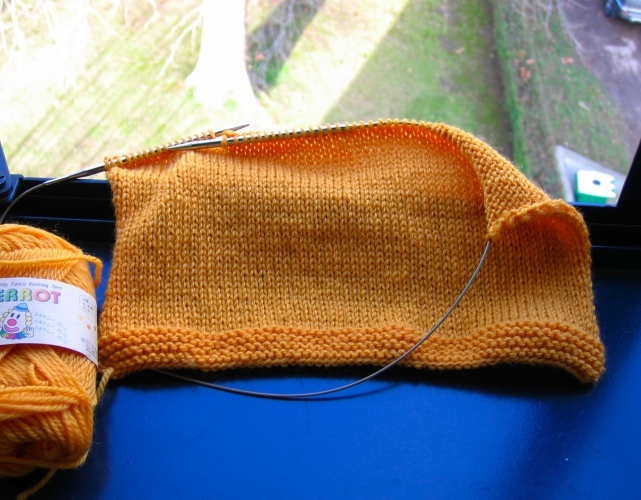 Others might choose a 3-needle bind-off – really, any join method you prefer will work. Likewise, the instructions say to join the sides with mattress stitch. However, if you didn’t know that, you’d just choose whatever method you find most appropriate. The only part left after that is the tassels on the collar, as seen in the photo of the finished pattern. Basically, we’re shown that there are two tassels, each one attached to one lapel. The text in the middle informs us where they’re located relative to the center of the collar. The text at the side tells us how to make the tassels. Remember how in the first lesson I mentioned that if you see ２本どり it means to use 2 strands of yarn? 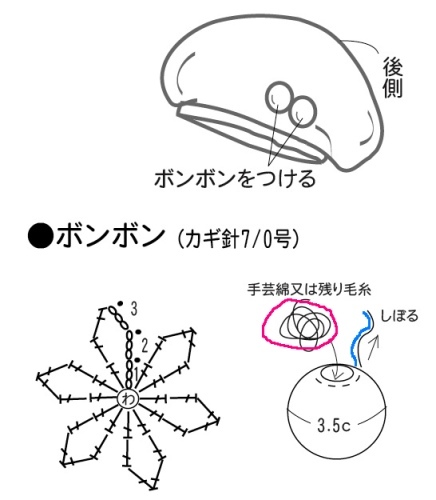 Well here in the tassel instructions we see ５本どり which shows us that the tassels are each made with 5 strands of yarn. It also says 14cm, so the tassels are made with 5 strands of yarn, each 14cm long. No specific instructions are given for attaching them to the sweater, so use whatever method you want. So that takes us to the end of this sweater tutorial. Any questions about this particular pattern, or using Japanese knitting/crochet patterns in general? Just leave a comment and I’ll answer to the best of my ability. p.s. Don’t forget about the Pierrot Yarns knitting and crochet contest! The deadline is May 31, and there are some really great prizes. I can’t enter myself (it wouldn’t be fair, since I’m employed as their translator), but I’m eager to see what other people enter. I’m sure there will be some really beautiful items. Welcome back, everyone. Hope your sweaters are going well. I just finished the back of mine, so soon I’ll cast on for the front. First, I’d like to go over something I forgot last time and only realized when a helpful soul on Ravelry reminded me. 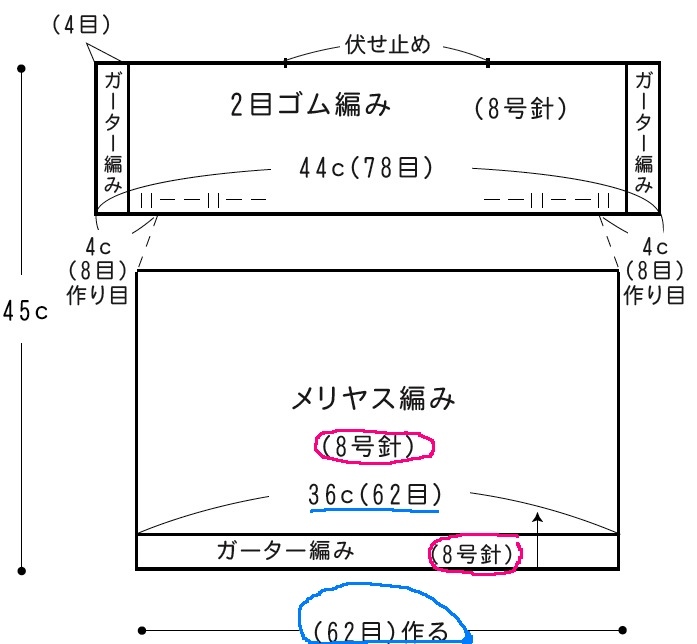 At the bottom of the schematic (circled in pink), you’ll find a number plus 目 indicated how many to cast on. Here it’s 62目, so 62 stitches. 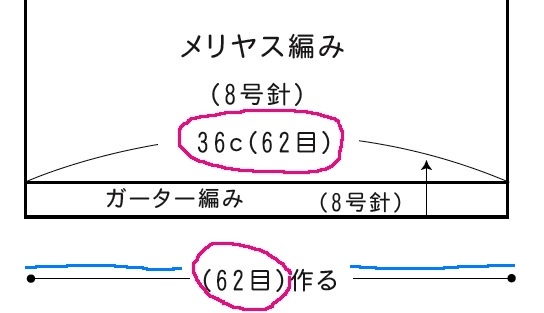 You’ll also see 36c (62目), also circled in pink. That c is just centimeters, and in some patterns you’ll see it abbreviated as cm instead. It just reminds you that not only are you supposed to have 62 st, the piece should be 36 centimeters wide. I’ve also marked the line at the bottom in blue. What’s that for? Here it serves two functions: it tells us that we cast on 62 st along the edge, but it also tells us that we’re working the piece flat. If it were an oval instead of a line with two endpoints, it would mean that we should work the item in the round. This is especially important in some patterns where the front and back are the same, because the pattern may only show you one of them. You need to check that line at the bottom to see if you’re supposed to knit two identical flat pieces or one circular piece. That’s pretty straightforward, right? It may seem like a lot of info all at once, but it’s nothing we can’t handle, right? We all know that k2p2 ribbing is k2, p2. But what this is telling us is that when we get to the end of the row, we should end with k2. That’s it, and it’s just because 70 st isn’t a multiple of four, so they’re telling you what to do with those leftover 2 stitches. (The sweater is 78 st wide after casting on additional stitches for the arms, but remember that 4 on each edge are in garter stitch. That leaves us with a k2p2 center panel of 70 st.) In a written pattern, this would be written out as something such as *k2, p2*, rep from * to * until 2 st remain, k2. Finally, we need to know how to finish off the back piece. Circled in blue below, we have 伏せ止め “cast off”, but it doesn’t tell us how many stitches. In my experience, it will usually say a number first, then 伏せ止め “cast off”, but here it doesn’t. We can still tell how many stitches to bind off, though, because the stitches are all listed in the line above the back schematic. I’ve drawn red lines down connecting them to make it really clear. That middle section to bind off is 36 stitches (21 centimeters) wide. There are no instructions about what to do with the remaining stitches. Sometimes there will be, but only if the designer really wants you to use a certain technique. Otherwise, Japanese patterns assume that you know an appropriate method and will use it. So here, for example, you might bind off the shoulder stitches in pattern, or use 3-needle bind-off to join the back and front shoulder stitches. Since it doesn’t explicitly tell us to bind off the shoulder stitches, I assume working a 3-needle bind-off from live stitches is the best alternative here, so that’s what I’m choosing. The only part left now is to figure out the neckline for the front. I’ll leave that for the next lesson, because this is already really long. (I wrote the shaping instructions below first, so I’ll just leave them here for now.) If you have questions about the neckline before next week, please feel free to post in the tutorial thread on Ravelry. Shaping in Japanese charted patterns: This particular sweater doesn’t have any shaping, so we haven’t yet covered how increases and decreases are depicted in Japanese charted knitting patterns. (For crochet patterns, there’s usually a complete chart of the armhole and neckline decreases.) So I’ll show you how the shaping works using this pattern, French-sleeve Ensemble Sweater (Pierrot | Ravelry), which flexibleknits recently asked me about. The ones circled in pink are for the arms. Since there’s no corresponding list of numbers on the front diagram, it means the shaping is the same for the front and back (i.e., use the back armhole shaping for the front as well). Circled in blue on the back piece is the neckline shaping (see that tiny line pointing to the neckline?). Circled in blue on the front piece is the neckline shaping for the front piece, also with a line pointing to the neckline. So here’s an example where the shaping for the front and back are different. Circled in green is shaping for the shoulders, which you’ll only find in some patterns. 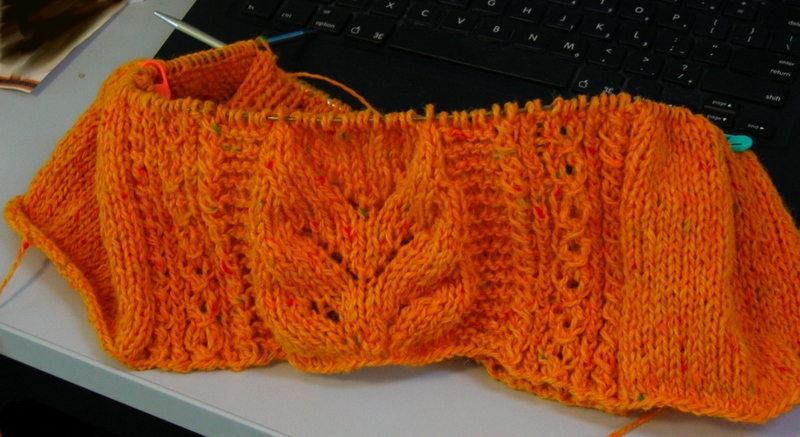 Finally, the parts underlined in orange tell you how many stitches to bind off at the neckline. The result is that you’ve increased by 4 st on each side, 8 st in total. Easy, isn’t it? The reason the pattern switches to showing symbols in rows rather than in a circle is that for several rows, you’re just going to work even (i.e., no increases), and then you’re going to decrease. It’s hard to chart both increases and decreases in a circular chart, hence the switch to lines. Anyway, just trust the chart! After slipping to join the last round of the circle chart, chain 3 as shown in the first round of the straight chart (labeled 9 over on the right side of the chart). Then dc in each of the next 4 stitches, work your bobble cluster thingy (yes, very technical, aren’t I? ), and continue. You should see that the stitches align exactly with the pattern stitch you’ve already established for the top of the hat. Decreases begin on round 14 and continue in round 15. After that, the chart lines have been renumbered, starting with round 1 and going up to round 5, presumably to show that this is a new section (the edging). Renumbering just seems to be up to the whim of the pattern designer – sometimes they’re renumbered when a new section starts, sometimes not. Anyway, the important thing here is that we have four rounds of single crochet (just the plain X on the chart), followed by one row of crab stitch. Up until I did the rounds of single crochet, this hat actually fit my huge head. I didn’t cast off, actually, because I’m planning to undo the single crochet and leave this as a beanie so that I can wear it myself. On the left is the chart, and on the right, they’re showing you to stuff the pompoms. The messy lines I’ve circled in pink represent the stuffing, with a helpful arrow showing where it goes (although I’m pretty sure we can all figure out where stuffing goes!). 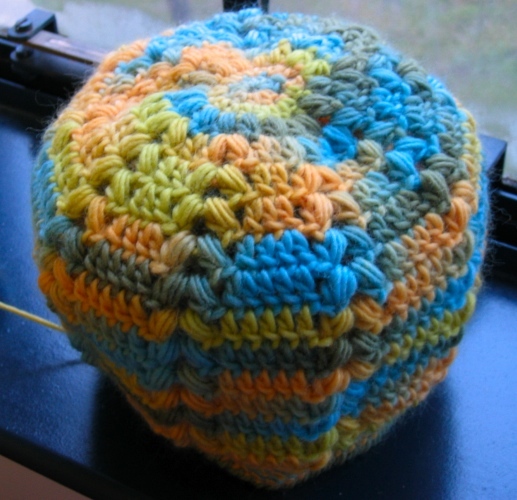 The blue line is showing that you’re supposed to use your working yarn to pull the sphere shut. No detailed information is given on how to attach the pompoms to the hat. The Japanese text in the diagram merely says “attach pompoms”, so the designer assumes you’ll choose an appropriate method. Personally, I would either sew it on or slip stitch the pompom to the hat before cinching it shut. It’s really up to you, though. So that should be everything you need to know to work on this pattern or nearly any Japanese charted pattern. Please let me know if you have any questions, and thanks for tuning in. I’m using the suggested yarn, Pierrot Yarns Junmo Namibuto2, in a nice egg-yolk yellow color, and US 8 knitting needles. The first step in working the pattern is obviously seeing what exactly it is that you’re supposed to do. If you look at the pattern, you’ll see a schematic of the back piece on the left and the front piece on the right. This pattern is very simple – no shaping, no sleeves, etc. – so the front and back are nearly the same. The only difference in the schematics is that the front shows the neck opening. Then at the bottom, there’s a diagram showing how to attach the fringe to the neckline (as seen in the photo). Now, normally a Japanese knitting pattern will also have stitch charts at the bottom. This pattern doesn’t have any fancy stitch patterns, so there are no charts. Instead, the names of the stitches used are written onto the schematics. That’s where the photo and a Japanese knitting glossary come in handy. From looking at the photo alone, it seems we have a garter stitch hem, a long stretch of stockinette stitch, and then ribbing up top. 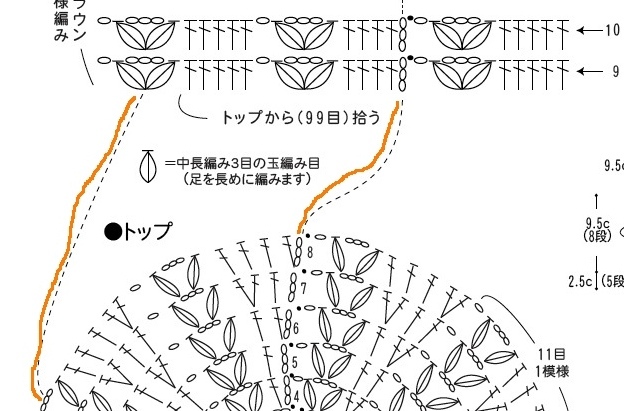 We can confirm that by looking up the terms written on the schematic in a Japanese knitting glossary such as this one. 2目ゴム編み (futame gomu ami) – literally “two stitch rubber knitting” – the rubber obviously comes from the fact that ribbing stretches like, well, rubber. UPDATE: I knew I was forgetting something! I didn’t mention how to tell how many stitches to cast on. D’oh! Sorry about that. Most of you have probably figured it out already, because it’s pretty clear, but here’s how to go about it: look for a number followed by 目 at the hem. That number is the number you need to cast on. So, for example, in this pattern, it’s 62目 = cast on 62 stitches. Also note that there’s an arrow pointing upward from the hem, which quite simply means that we’re knitting from the bottom up. Some patterns have an arrow going down, meaning that the edge is worked downwards after the body of the sweater is finished. 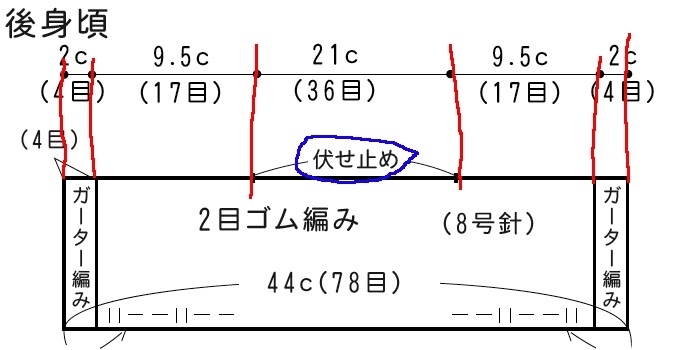 Finally, inside the hem portion of the diagram, and again in the body portion, the needle size is written. Here it’s a bit redundant, since we were told up top to use Japanese size 8 needles (4.5mm). That means the hem and body are both done with the same size needle, but that won’t always be the case. 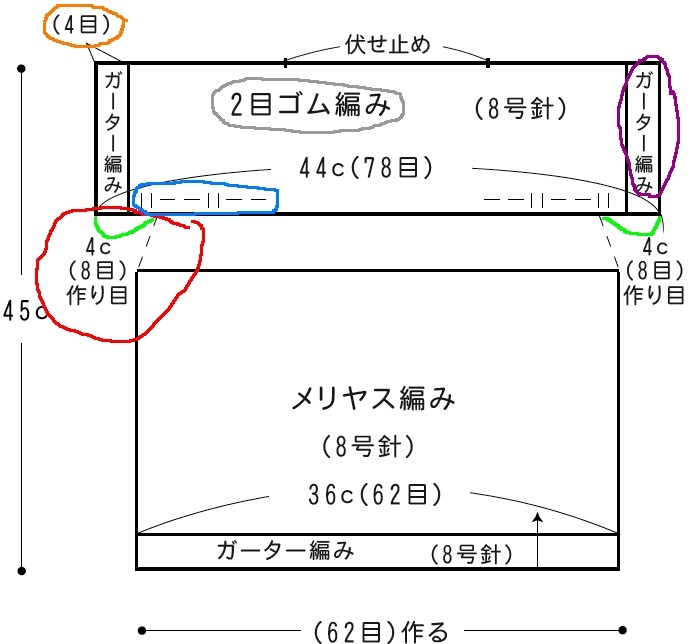 So look for a number followed by 号針 to confirm the needle size. 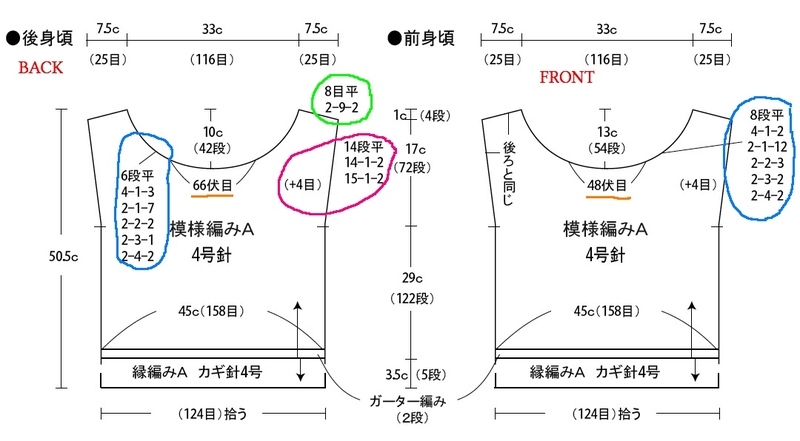 In this pattern, we have 8号針 in the hem area, 8号針 in the body, and 8号針 in the shoulders/neckline area. 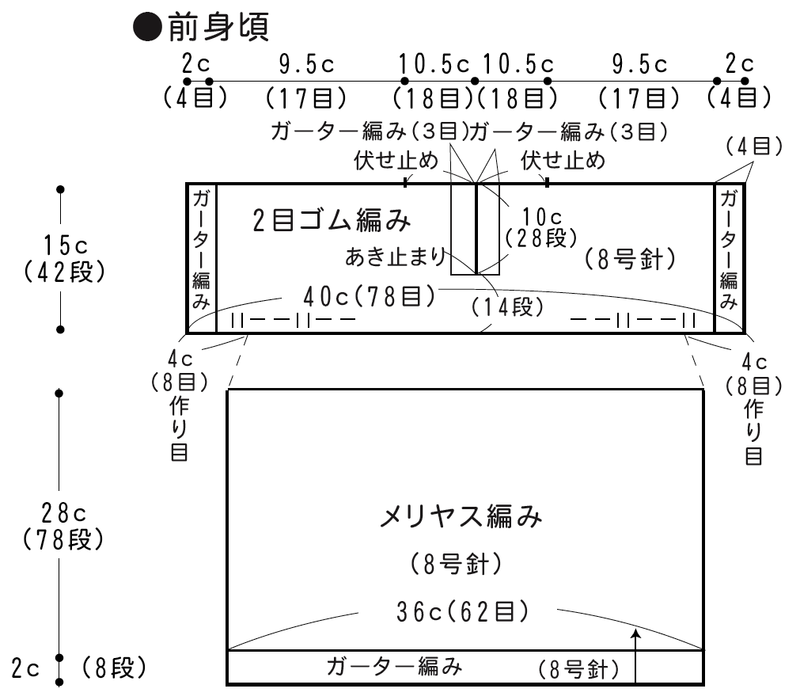 So we need to use that (Japanese) size 8 for the whole sweater. Tezukuri Town (Nihon Vogue’s website) – this is in Japanese only, but it’s got step-by-step illustrations for each knitting symbol, so you can see how to do it regardless of what it’s called in English. In a later lesson, I’ll show you a pattern with stitch symbols and go over how to interpret it. I think it’s best not to mix more than one pattern per lesson, though. Later I’ll also go over how shaping is indicated in Japanese knitting patterns, since this pattern doesn’t have any shaping to speak of. Anyway, I’ve told you enough to get you up until where the ribbing starts at in the chest portion of the sweater. Next time I’ll show you what the symbols at the top of the sweater mean, including casting on some additional stitches. Then we’ll go over what the pattern’s telling us about finishing, particularly the tassels on the neckline. That should about wrap it up, because I think two lessons may be enough for this simple sweater. Later lessons can be about other patterns if people are interested in continuing. * OK, I lied: there are some knitting symbols, but only two: knit and purl. They’re in the schematic where the body of the sweater changes from stockinette to ribbing, and they’re there to tell you how the ribbing should be aligned (k2, p2 at the right edge, ending with k2 on the left edge). More on this next time.